Last updated: May 3, 2018 by Rootwell Products Inc. It always starts out innocent enough. You think you have found the perfect plant for that spot in your garden that always looks bare or is hard to plant. You find a perennial that boasts its hardiness and promises to be low-maintenance or no maintenance. The plant takes to the spot readily and all your cares are over! 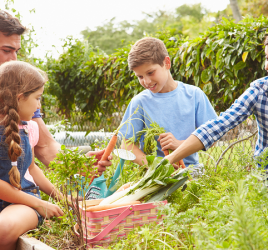 What you may have just done, however, is plant a highly invasive plant that will end up taking over your garden and eating all your other plants. Of course, it won’t actually eat your other plants – that’s silly. However, it might just invade their territory. It may make your life miserable by making you constantly monitor its attacks and pull it out like a weed. Here are five of the most invasive plants you may want to think twice about planting. You may be familiar with lily of the valley (Convallaria majalis) because of its appearance in many royal bridal bouquets and most recently carried by the Duchess of York. This perennial plant grows from underground rhizomes that spread horizontally and often with amazing speed. They have lovely lush green leaves and delicate, sweet-smelling white flowers that resemble tiny bells on stalks. The scent of a lily of the valley is heavenly. It is no wonder they have graced the arms of many blushing brides throughout the centuries. They also are rumored to symbolize luck in love. However, the blooms don’t last long. The stalk-like leaves do remain for the rest of the growing season, making an attractive ground cover. 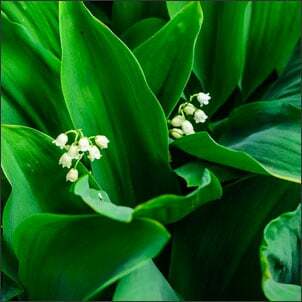 Lily of the valley isn’t always an invasive plant. It could more suitably be called aggressive. The rhizomes of the plant are powerful. 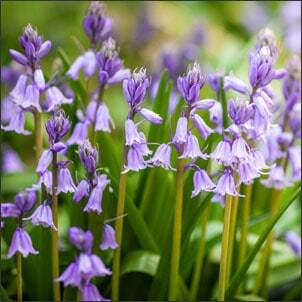 They can tunnel and spread with ease and will do so unless the plant is in poor soil. So if you want this plant to stay contained in a small area, be prepared to do a lot of digging every year or to be frustrated. It will take over the habitats of your other plants. 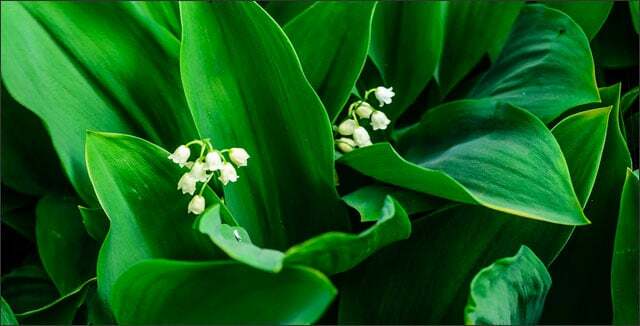 If, however, you have a large area or don’t mind a spreading plant, you may love having lily of the valley in your yard. Most of us don’t think of anemones as a fall flower. These tall, graceful stems with delicate, umbrella-like petals remind most of us of spring or summer. 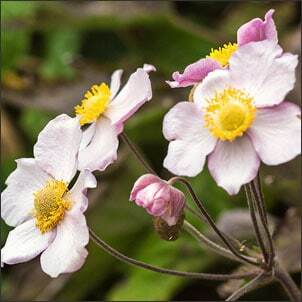 However, Japanese anemones do bloom when most other flowers are dying, for about 8 weeks. This makes them especially prone to be invasive in cool climates. Hupehensis have rose pink flowers and have better heat and drought tolerance. Vitifolia are often bright pink and flower a little later. They are hardiest in cold and least likely to suffer from winter injury. Hybrida are hybrids of the first two and come in various shades from white to almost red. Although these flowers sound beautiful, and they are, Japanese anemones will tolerate almost any variety of sun, from full sun to moderate shade. They do well in most types of soil but what they really like is loose mulch and soil. In these conditions, Japanese anemones can become invasive, forming almost like a tall ground cover. If you are not careful you could end up with a whole garden full of clusters of these tall white flowers. You have seen yarrow in many bridal bouquets in the last ten years or so. It looks like a wildflower and has a bright yellow, red, white or light pink color. The tiny flowers grow in large, umbrella-shaped clusters, so each stalk can take up a large surface area. The reason this flower looks like a wildflower is that it is essentially, a weed. In addition, it can get quite invasive. 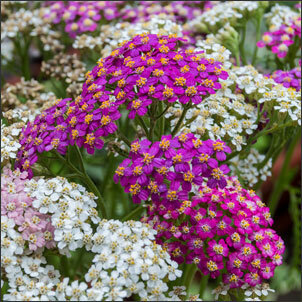 Yarrow is easy to care for and comes in many new colors and sizes now. However, you might find it easily invading other beds and even down into your grass. The reason for this is that it’s highly adaptable. Like many other invasive plants, it can grow in any soil and under many conditions. Additionally, as you may have guessed – it spreads from rhizomes! Just like lily of the valley, the plant spreads underground. Any disruption of the rhizome and it breaks off, forming a new plant. Then the flowers produce many thousands of seeds which can be spread by the wind and remain viable for 9 years. That is one tenacious plant. If you think you’re going to plant yarrow and keep it completely under control, think again. I don’t know why ferns have a reputation for being difficult to keep alive. In cool climates, these plants are impossible to dig out and can become the most dominant plant in a forest or even moderately shady location. Ferns grow everywhere, in shade and sun, and grow from rhizomes (no big surprise there). The other thing ferns do is use a form of chemical warfare called allelopathy to inhibit the growth of other plants in surrounding areas. That is why you see them dominate shady woodland areas. The combination of their hardiness and shade tolerance coupled with having a chemical upper hand makes them the most dominant plant around. 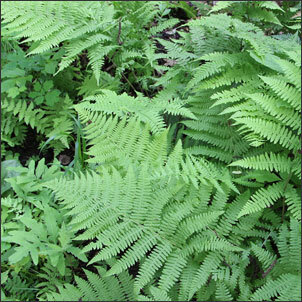 The best way to control your fern population is to keep some of these beauties in pots around your patio or from hanging baskets on the porch. You can even keep them inside as long as you water them regularly. But if you plant them in your garden or under your trees, be prepared to constantly fight them back to keep them in their designated area. Ladybells or false campanula are one thing: they look sort of like a purple lily of the valley. These guys aren’t invasive, they are good in partial shade and they don’t take a lot of care. They can sometimes be aggressive. However, they aren’t even close to the invasiveness of the creeping bellflower (Campanula rapunculoides). These blue, trumpet-shaped flowers grow in a tall stem. 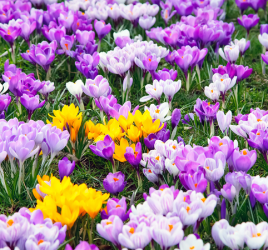 You have probably seen them in and around your yard and thought, oh, those are pretty. I didn’t plant them, but I’ll keep them! This is a bad idea. In addition, definitely don’t buy them if you come across them for sale. Creeping bellflower spreads via rhizome and seeds – just like yarrow. Those rhizomes are 8 inches beneath the surface. In addition, they are moving under all your flower beds, under your lawn, and anywhere this plant wants to go. This perennial thrives in dry soil, wet soil, full sun or full shade. It can even self pollinate and make seeds. This is why it has gotten the classification of noxious weed in some areas. Do your garden a favor and dig it up if you find it, as soon as you find it. It can be hard to say goodbye to any beautiful plant – and each of these qualifies as that easily. 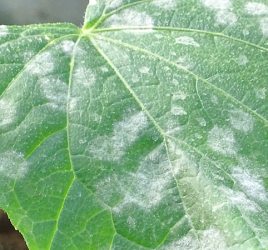 The problem comes when a plant wants to colonize every area of the world. We know that biodiversity is actually better. Try keeping these invasive perennials to a minimum by planting them in pots or not at all.